The release of iOS 6 brings a few handy new features to help you manage your notifications. For anyone who has received a late night text message disturbing their sleep, or accidentally received a dumb phone call in the middle of a meeting, the new Do Not Disturb feature is a lifesaver. Here's how to manage it right. Do Not Disturb is the iPhone's new feature that shuts down all incoming messages for as long as you have it on. It's a great feature that helps you go offline for short durations of time, but you'll likely want to set it up so certain people can get through to you. The nice thing about Do Not Disturb is that it's relatively robust. You can turn it on manually by going into Settings and tapping the Do Not Disturb button on the left hand side. That's it. When you're done and you want to get contacted again just jump into your Settings and reenable it. 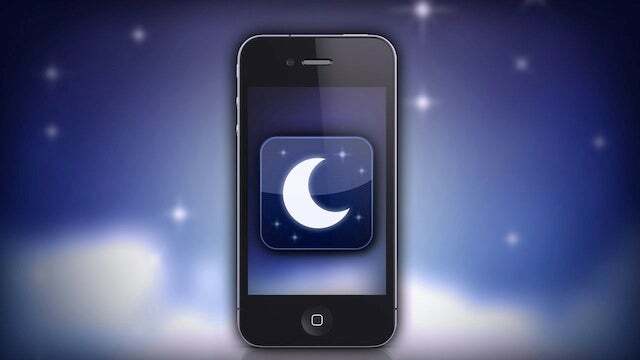 You can also set up Do Not Disturb to operate on a schedule—like when you're sleeping, or early in the morning. To do this, go to Settings > Notifications > Do Not Disturb. 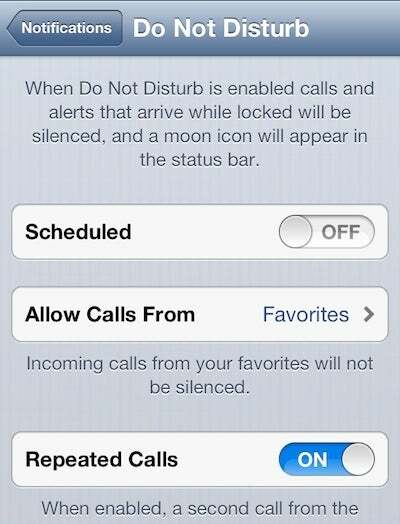 Here you can set up a specific schedule when Do Not Disturb runs, and set up who you allow incoming calls from. Do Not Disturb is great for suppressing incoming calls, but you probably don't want to block everyone. You can allow incoming calls in one of two ways. First off is the "Repeated Calls" setting. This means that even if Do Not Disturb is active, if a person calls you twice within three minutes the second call will go through. This is good for any type of emergency situation that might pop up. The second setting is a VIP list. Tap the "Allow Calls From" button, and you can allow incoming calls from specific groups in your contacts, your favorites, everyone, or no one. Favorites seems like the the most logical to set up since you probably already have those people set up on your phone (Phone > Favorites). On top of Do Not Disturb, iOS 6 adds a few new features to the regular old phone app. They're primarily set up to help you remember to call a person back. When you receive (or miss) an incoming call, you get two options. When you receive an incoming call that you can't reply back with a call, you can reply with a simple text message. 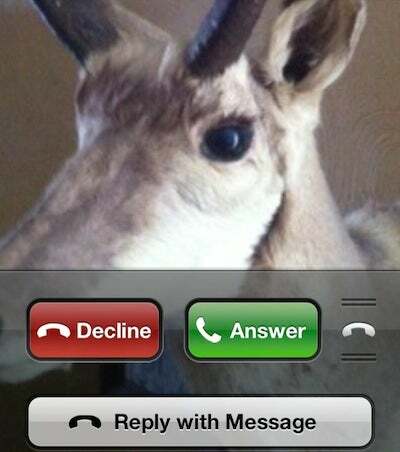 To do this, swipe up on the phone icon when someone is calling you and tap the "Reply with Message" button. You'll get a set of quick reply options for your text message, including, "I'll call you later," "I'm on my way," "What's up?" or your own custom message. Tap the one you want and your reply goes through right away. If you don't want to deal with the call at all, you can also set up a reminder to call the person back. When the call comes in, swipe up on the phone icon, tap the "Remind Me Later" button. You'll have a few different choices, including setting up reminders for, "in 1 hour," "When I leave," "When I get home," and "When I get to work." When one of those events happens you'll get a notification through the Reminders app to call the person back. The point of Do Not Disturb and the new phone features is to give you the ability to get things done and not worry about interruptions. It's handy not just for getting through a night of sleep, but also for those days when you really just need to ignore the world around you.